Synthetic microfiber textiles have become a popular choice for residential and industrial cleaning. What makes them a preferred choice over common cloth or paper towel? Technically speaking, their fibers are so fine, they can be woven into strands that can better penetrate minuscule cracks and creases. Many times less than the width of a human hair, microfibers can be spun with tiny branches or filaments that can capture microbial bacteria, and absorb liquid up to seven or eight times their weight. In addition, microfibers can create static electricity to capture dust particles that would otherwise be stirred up into the air during dusting. Aside from their technical attributes, the availability of cloths in a range of colors provides a simple benefit. 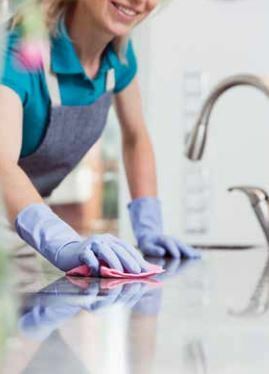 Users can designate individual colors to specific tasks, thereby reducing the risk of cross-contamination across floors, counter tops, sinks and toilets.